All of us have a fighter within and once you get that 1st taste of the fight it is inevitable a part of you for the rest of your life. However, not always is your fight in a cage or on the mats. Life has many battle fields and sometimes the battle is teaching your children to become potty trained or struggling to fit in all your responsibilities into just one day! Regardless the battle field, your skills as a warrior are always put to test. Among our modern-day warriors is Emily Kwok, by far one of the best athletes of our time. 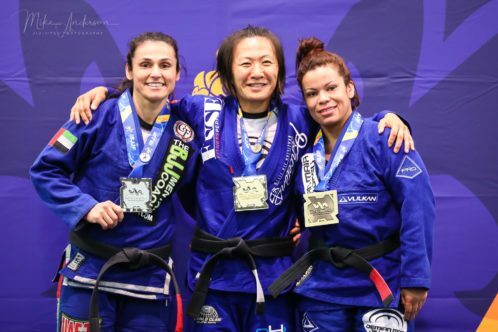 Holding multiple world championship titles and MMA titles she recently made her vicious return at the 2018 IBJJF Mater World Championships after a 6 year hiatus from the competition scene. 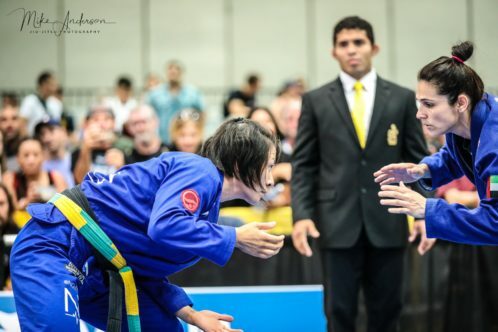 Her return was among some of the highlights of the 2018 IBJJ Master World Championships. Fans from all across the BJJ community gathered to witness 1st hand the victorious return of a legend. We caught up with Kwok to talk to her about this monumental experience as she transitioned back into the competition world. You recently returned for to competition after a 6-year break. Was returning all that you expected? I don’t think it could have been any more ideal. I worked very hard to prepare an answer for everything, nerves, strategy, execution, etc. I would often visualize my matches, envision what I was doing before and after. It’s a high bar to set expectations for yourself, be accountable and throw everything you have into honoring the goals you set. It’s easy to play it safe and undermine your potential. The break gave me enough confidence to aim high. What did it feel like to return to competing? Thrilling. It’s like getting on the roller coaster that you know will freak you the f*** out, but be so awesome that you will jump right back in line to ride again. It felt familiar, felt like home in some ways. I’ve dedicated most of my adult life to competition. Learning to live without it was awkward. Being back in the fight and feeling excited about it makes me feel whole again. Having a thriving career, academy and two beautiful children since you last competition how was it different getting ready for competition this time round compared to previously? Gratitude was a big theme in my training camp. If I didn’t have such an incredible support system around me I wouldn’t have been able to be as selfish. Being selfish as an athlete is important — putting your needs first. You can’t be the best if you’re not putting the effort into developing your best self. It also requires your trainers to do the same. I’d spent the last 6 years putting everyone else before me. I didn’t know how much to train for this landscape. I was used to fighting ten min rounds in the adult division and many of the women I was fighting had dedicated their lives to be the best athlete possible. What did fighting five minutes against women within a five year age range who most likely have professional careers mean? Do I train less? more? the same? Since I had no idea what to expect and because I had been away for so long, I erred on the side of caution and trained as I probably would have for Mundials. The only difference is that I adjusted the intensity of my BJJ training to accommodate more recovery. I didn’t train hard BJJ sessions 6 days a week. I’d usually do 1-2 intense balls to the wall sessions a week, but the rest were moderate or technique heavy. I wanted to do my best to avoid injury. I was very cautious to choose lighter training partners and tried to keep my rolls fun. I didn’t want to make my training too heavy and serious. After all, I’d come back because I was inspired and wanted to enjoy this experience. I also did way more recovery than I used to. Yoga, soft tissue manipulation and PT were incorporated into my weekly routines. My strength and conditioning coaches were careful to push me hard, but never to the point of killing me. They didn’t want to push me so hard over the edge that it would take me days to recover. I was kinder to myself. How did you manage to juggle family, work, academy and a life while getting ready for this competition? I have a wonderful husband, business partner and boss. My husband Gerry was so excited for me when I said that I was thinking of competing again. He told me whatever I needed, he would be there. He would watch the girls, cook, clean, pretty much captain the ship so that I could train. My business partner Art and I have worked hard to have a wonderful staff at our school. He, my staff and students were happy to help make room for me to train vs. teach when I needed. My boss Josh was incredible. So supportive and invested in my success. He being a lifelong learner knows more than anyone what dedication it takes to be compete at the elite level. He was elated to give me the space I needed to train and the guidance whenever I needed it. Do you have any advice for other moms that want to compete but are worried about managing it all? With all the responsibilities I have, I can appreciate that I am in an unusual circumstance being able to have the freedom to prepare like I did. Many mothers may not have a partner that is willing or able to hold down the fort or a job that gives them the time to train. First, I would advise them to make their ‘worry’ tangible. Write down how many hours of training they feel they would need to feel prepared. Confidence can be instilled from knowing you did what you needed to do. Once they quantify the hours, they can look at their schedule, figure out what they can do and when. If they run into obstacles, look into babysitters or help from friends. As a more mature athlete, you know you have more going on in your life than just training and competition. Feel good about the life you live. Have gratitude that you have this outlet to express your best self. Don’t stress about what other people are doing. Be grateful that you can do what you can — and enjoy the fight. How has the competition circuit changed since you last competed? What was different about competing for you now? It’s so much more inclusive. The better part of my competitive life was spent just waiting for anyone to show up. If anyone did show up, it was 1-2 competitors and sometimes we spanned belt levels, age, weight…we made a lot of accommodations for the opportunity to fight at all. Today, women generally have opponents or choices that are much better than the choices I was given. It occurred to me when I was fighting that I was also an older black belt. A lot of women who are black belts now may be from a younger generation. I’ve been training for 17 years. In some situations, I was a black belt during someone else’s entire journey from white to black. Being away from competition was one thing, but to feel that I have trained with so many more bodies than most female black belts today was nuts. Going forward what are your competition goals? Will we be seeing you take on any super fights or any other tournaments in the near future? My family, my school and my job will always dictate when and what i can do for myself. That being said, winning the Masters after my hiatus gave me a renewed confidence in my abilities. I would like to think that I’ll periodically continue to challenge myself. I really like the vibe of the Masters tournament. I feel like the majority of the athletes who attend that tournament are all in the same boat. Individuals who have life responsibilities but just love BJJ. They go to fight because they love what they do and want to indulge in their passion. The door is open, but I’m not looking to make this a second run of competing in every tournament that comes a long. I’m not looking to prove anything to myself anymore and at this point winning medals isn’t about establishing myself in the industry. I will compete when I’m inspired because I enjoy it – I look forward to this next chapter.